President-elect Barack Obama greets soldiers as they eat Christmas dinner at Marine Corp Base Hawaii in Kailua, Hawaii on Thursday. KAILUA, Hawaii — President-elect Barack Obama visited military families while they ate Christmas Day dinner, thanking them for their service and posing for pictures. Obama on Thursday visited Marine Corps Base Hawaii near his rented vacation home and briefly chatted with enlisted members who ate turkey, ham and roast beef. He didn't make formal remarks or speak to reporters during the stop, one of the few public sightings of the president-elect on what aides call a private family vacation. 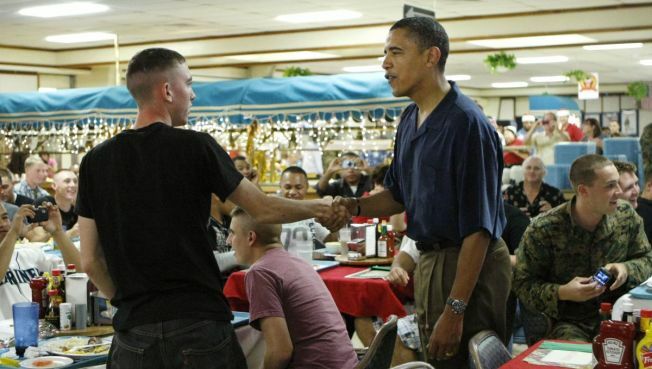 "Hey," Obama said as he walked into the mess hall wearing a short-sleeved shirt and slacks. "Just wanted to say 'hi.'" Obama lingered a few minutes at each table as the Marines and sailors and their families stood to greet their next commander in chief. At other tables, the visitors ate candied sweet potatoes with marshmallow topping, mashed potatoes and simmered corn and broccoli. "What part of Indiana?" he asked one person. To another: "This is the East Coast table, huh?" Obama and his family planned to spend their Christmas holiday mostly out of sight, an accomplishment given his two-year, high-profile marathon to win the presidency. Obama, wife Michelle and their two young daughters opened presents earlier Thursday and planned their own dinner of turkey and ham, according to aides. They did not release any other details. The Obamas arrived in Honolulu on Saturday with four aides, his Secret Service detail and a small group of journalists. Since then, he has been largely sequestered at the beachfront estate. With less a month before Obama takes office on Jan. 20, he is taking every step possible to make sure this holiday is as private as possible — something he bemoaned while walking to a driving range last Sunday. "OK, guys," Obama said, recognizing the photographers snapping pictures. "Come on. ... How many shots do you need?" That was one of only a handful of trips Obama and his motorcade have taken. He and Michelle Obama have visited Marine Corps Base Hawaii for daily morning workouts. Twice, he and friends have played a round of golf. He attended a private memorial service for his grandmother on Tuesday and scattered her ashes into the Pacific Ocean. While the Democratic president-elect vacations in his native Hawaii through the New Year, he and his aides have taken careful steps to minimize his profile. He has no public schedule while vacationing, although he remains involved in transition plans and has received intelligence briefings. While Obama's aides have taken steps to keep the vacation low-profile, he hasn't been entirely successful. Photographers captured images of him scattering his grandmother's ashes from a rock ledge on Tuesday while the press corps waited in a bus. Another photographer captured the future first family — including a shirtless Obama — in the backyard. The Secret Service has blocked the street where he is staying, citing security concerns. A few cars a day have rolled into the dead-end street, but they did not get past the checkpoint. And a few neighbors who tried to walk past the house on Christmas Day were rebuffed by agents. 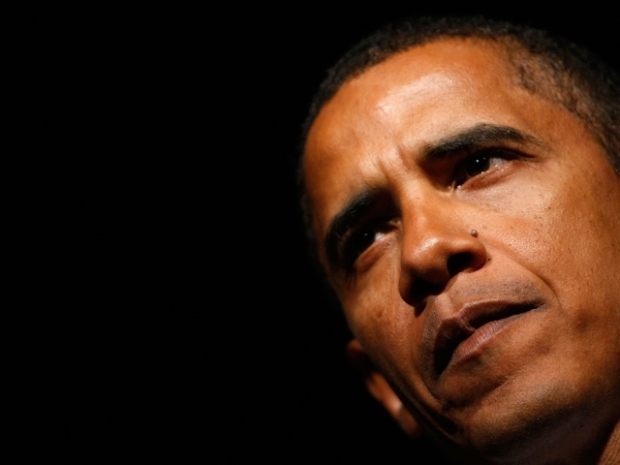 One man left with an aide a Christmas card addressed to the Obama family. It featured a palm tree with the word "peace" written on it.